Sometimes when on vacation with the family it’s good for the guys to getaway and enjoy some time doing guy things. The coastal community of Sandbridge Beach is just the place for such a getaway. With golden shores, professionally designed golf courses, seafood hot spots and miles of waves to enjoy, you will want to make your guys’ getaway an annual event. 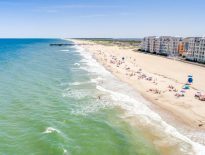 Sandbridge Beach features about 5 miles of oceanfront just south of the busier Virginia Beach Resort area. The more secluded location of Sandbridge means fewer crowds and better opportunities to enjoy swimming, surfing, or a game of beach volleyball. If you just want to work on your tan, the wide, pristine beaches are perfect for that too. Hell’s Point Golf Club — If adventure is your thing, Hell’s Point may be the course for you. Designed by renowned architect Rees Jones, this award-winning course offers a par-72, 18-hole challenge of quirky fairways, multiple lakes and 61 sculpted sand traps. Heron Ridge Golf Club — Unique topography and open-to-the-winds links-style quality make Heron Ridge a beach golfer’s dream. Designed through the collaborative effort of golf course architect Gene Bates and pro golfer Fred Couples, this course features 13 to 18 holes of water hazards, natural wetlands and mature stands of oak, beech and elm trees, assuring golfers of all levels an enjoyable, yet challenging, game. Bay Creek Golf Course — With a variety of native trees and several holes framed by giant sand dunes, Bay Creek will delight the nature lover in all golfers. With four holes on the shores of Chesapeake Bay and eight holes on Old Plantation Creek, you will feel you are in golfers’ paradise on the perfectly manicured par-72 course. Baja Bayview Lounge and Grill — Since it opened in 1975, the Baja has been a favorite of locals and visitors alike. Priding itself on fresh food and a friendly atmosphere, the eatery’s menu covers everything from a sizzling burger to local seafood specialties. Be sure to try their crab cakes when you stop in for dinner from 5 to 10 p.m. Wednesday through Sunday. They offer lunch from noon to 4 p.m. Saturday and Sunday, as well as a brunch menu on Sunday from 10 a.m. until 2 p.m.
Sandbridge Island Restaurant — Located right on Sandbridge Beach, this restaurant specializes in seafood (including steamed and raw clams and oysters, shrimp and crab legs), but you can just as easily order soup and salad or a few drinks. Delivery and takeout pizza are also available (even a seafood pizza with crabmeat, shrimp and scallops!). Baja Bayview Lounge and Grill — While known for their tasty menu, Baja Bayview’s fun continues late into the evening each weekend. Enjoy some drinks and appetizers as you watch the boaters and surfers brave the twilight waves. Bay View Lounge — The dance floor is open all night long at the Lounge — and so is the outdoor patio facing the bay. Enjoy pizza with your friends or shrimp and hors d’oeuvres with the ladies as live bands keep the party rocking late into the night. Sandbridge Restaurant — Savor a delicious meal while listening to the relaxing sounds of water lapping on the shore at this local favorite. Live entertainment will make the wait seem shorter, but why not join the fun on karaoke night? With five miles of beachfront to explore, you will find yourself drawn to try your hand at riding the waves on a surfboard or jet ski. Paddleboards, kayaks and hydrobikes are always a safe choice to tour the coastline, but if you are feeling really adventurous, try propelling above the waves on a flyboard rental. It tends to bring out the superhero in everyone. The next time you’re taking a family vacation consider planning a getaway with the guys as part of your Sandbridge Beach vacation. With its sun-soaked beaches and secluded location, it is one of the best-kept secrets, and it could be just the break you need to recharge your batteries before you tackle that next project. Next Next post: Pool Antics! : Memory Monday July 6, 2015.